A pair of veteran pitchers – Long Beach State righthander Kyle Friedrichs (San Clemente, Calif.) and Nebraska LHP Kyle Kubat (Waterloo, Neb.) – headline the latest edition of CB360 Primetime Performers, a weekly honor roll that highlights players who performed at a high level with plenty on the line. Friedrich and Kubat are the CB360 National Co-Primetime Pitchers of the Week, and are joined by 13 others in comprising the week–7 Primetime Performers Honor Roll. Scroll down to see headshots, action photos and an info. capsule for each of the 15 Primetime Performers, covering games played during the final full week of March. The other 13 members of the week–7 Primetime Performers Honor Roll include: Cal Poly jr. RHP Casey Blomquist (Bakersfield, CA) … Baylor so. LHP Daniel Castano (Austin, TX) … Winthrop so. LHP Matt Crohan (Jamestown, NY) … Navy jr. CF Robert Currie (Atlanta, GA) … Florida Gulf Coast jr. RHP Jordan Desquin (Newport Beach, CA) … Kentucky sr. RHP Spencer Jack (Los Angeles, CA) … Middle Tennessee jr. CF Ronnie Jebavy (Murfreesboro, TN) … Southern Miss. 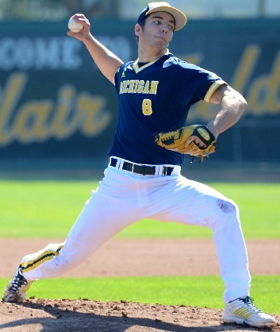 5th-yr. sr. RHP James McMahon (Hattiesburg, MS) … Arizona sr. C Riley Moore (Santa Barbara, CA) … Michigan fr. RHP Ryan Nutof (South Elgin, IL) … Iowa jr. RHP/1B Tyler Peyton (Grimes, IA) … Auburn so. 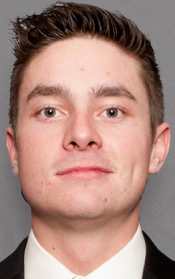 RHP/DH Keegan Thompson (Cullman, AL) … and New Mexico fr. C Cory Voss (Pueblo, CO). Over the years, there have been certain weeks when the bulk of the Primetime Peformers are pitchers and this is one of those weeks – with the 15 honorees including nine righthanders (two of them two-way talents), plus a pair of lefties, along with two catchers and a couple centerfielders. Five of the honorees are juniors, plus three seniors, three sophomores, a couple freshmen and a pair of fifth-year seniors. The 15 include five who hail from California hometowns, plus one each from: Alabama, Colorado, Georgia, Illinois, Iowa, Mississippi, Nebraska, New York, Tennessee and Texas. 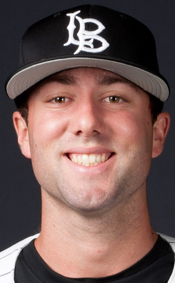 Long Beach State’s Kyle Friedrichs posted a two-hit shutout while facing only 30 batters, in the 2–0 series opener at cb360 #15 UC Santa Barbara. 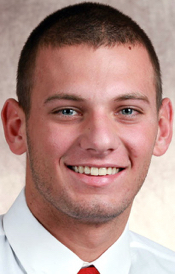 FRIEDRICHS – whose teammate Chris Mathewson was the week–3 Primetime Pitcher of the Week – is a converted closer who registered his fourth double-digit strikeout game of the season last week, en route to the top outing of his career. The fifth-year senior matched an equally strong complete game from UCSB’s Dillon Tate with the first solo shutout of his own career: a two-hitter that opened the series at UC Santa Barbara (cb360 #15) with a 2–0 win for the Dirtbags. Despite facing a UCSB offense that sported a .307 team batting average and was fresh off an 18–4 rout of LMU, Friedrich retired the first 10 Gauchos batters and ultimately faced only 30 batters (three over the minimum; one reached via error), with no walks or hit batters. The 6-foot-1, 190-pound right-hander kept nearly every ball in the infield, with a career-best 13 strikeouts, plus 10 groundball outs, a lineout to short, one runner caught stealing and only two outfield flyouts. UCSB’s only runner who ventured past first base came in the 6th, after an infield throwing error and a hit batter (no Gauchos reached third base). UCSB’s only hits vs. Friedrichs were Luke Swenson’s 1-out single down the leftfield line in the 4th, and pinch-hitter Billy Fredrick’s 2-out single up the middle in the 8th. 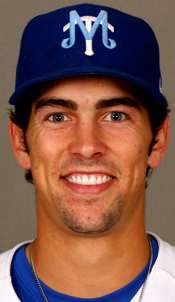 The veteran posted strikeouts in all nine innings and K’d eight different Gauchos batters. The two-hit shutout countered a strong complete game from Tate (2 unearned runs, 3 H, 1 BB, 10 Ks). 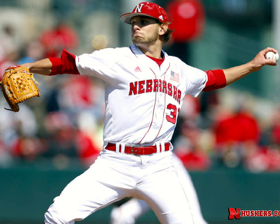 Nebrakska’s Kyle Kubat logged eight shutout innings to front a 19-K, 15-inning 1–0 win over cb360 #13 Texas. 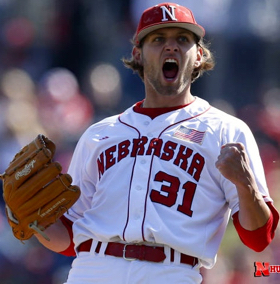 KUBAT fronted a 19-strikeout game from the Nebraska pitching staff during a rare 0–0 extra-inning thriller, with the Huskers scoring in the bottom of the 15th for a 1–0 win over Texas (cb360 #13) – en route to eventual series sweep. the senior southpaw logged 8.0 strong innings while combining with relievers Jake Hohensee, Colton Howell and Jeff Chesnut in the staff’s marathon 4-hit, 3-walk shutout. Despite allowing three early hits, the 6–1, 195-pound Kubat did not walk a batter and struck out nine, matching his career-best. 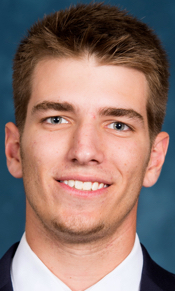 The fiery starter ultimately faced only 27 batters (three over the 8-inning minimum) and was part of a Huskers staff that allowed only seven total baserunners, with two reaching scoring position. Kubat – who retired the final 13 batters he faced – located 73 of his 102 pitches for strikes. His 24 outs included the nine Ks, plus eight groundball outs, an infield foulout and lineout, and five outfield flyouts. … As a reminder, the CB360 Primetime Performers often are a departure from most conference and national weekly awards – with an emphasis placed on quality of opponent, contribution to team success, significance of results, consistency of play, etc. Position players are evaluated not solely based on batting avg., home runs and RBI, but also for absence of costly negative stats such as strikeouts and errors. For starting pitchers, extenuating circumstances (such as first career start, quality of the opposing starter, etc.) can play a role in selection to the Primetime Performers. Ideally, the members of the Primetime Performers Honor Roll all have played a role in games that likely will have a significant impact on determining the 2015 NCAA tournament field – i.e key results, for notable teams. • Must have been playing for or against a CB360 top-50 team (in the Composite National Rankings) or performed at a high level in games that could be key to a team’s conference/NCAA postseason qualification; made significant contribution to team’s success and potential postseason positioning (single-game wins, “quality” wins, series wins, road wins, etc.). • Overcame adversity or extreme circumstances (for the team and/or individual); any other extenuating circumstances that make the individual’s accomplishments more noteworthy. • Any performance that is rare, historic, record-setting, etc., on a national level. * CB360 National Primetime Pitchers of the Week. All photos are courtesy of the respective schools. 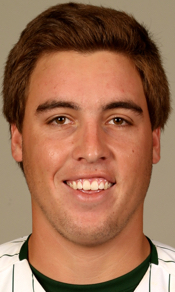 Cal Poly … RHP … Jr. Went the distance in 8–1 opener vs. Oregon State (cb360 #22), sparking Mustangs on to win the series – as Cal Poly (now 9–16) looks to jumpstart its disappointing 2015 season … faced only 31 batters (four over the min.) in efficient 96-pitch outing that limited the Beavs to four hits with no bases on balls … his only run allowed came in the 4th, after a leadoff triple and run-scoring groundout … the only other Oregon State runner that reached scoring position came one inning earlier, after a single and sac. bunt (stranded at second) … kept the ball down in the zone most of the night, with 21 of his 27 outs staying in the infield (17 groundball outs, three strikeouts and a popup to first base) … retired the first nine batters, en route to six 1–2–3 innings and his third career complete game … has compiled a 3.08 ERA and 2–2 record in his six 2015 starts (33 Ks, 14 BB, 30 H in 38.0 innings), with only one hit batter and no home runs allowed … collected first team All-America honors as a sophomore in 2014, on team that finished 47–12 and earned an NCAA Regional host spot (he had a 1.56 ERA and 12–2 record, plus 74 K and 20 BB in 98.0 IP) … served mostly as a midweek starter in 2013 (5.02, 6–2, 39 Ks in 52.0) … earned NSCAA first team All-America honors while starring for Bakersfield Christian High School. Baylor … LHP … So. 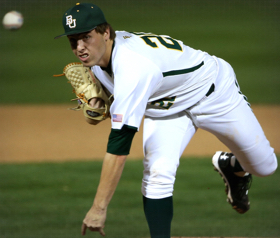 Turned in the first complete game of his career, working out of various jams in 3–0 win over Oklahoma (cb360 #34) in series opener, with Bears also taking gm–2 to claim the series … scattered five hits (two of them doubles) and five walks while locating 75 of his 119 pitches for strikes … first Baylor pitcher since 2011 to post a solo shutout and first to do so in a Big 12 game since 2008 … his 27 outs included four strikeouts, 11 groundball outs, four other infield outs (via popup, lineout or foulout) and seven outfield flyouts (plus one runner thrown out trying to stretch a base) … has compiled a 1.82 ERA and 2–3 record in eight 2015 appearances (six starts), with 26 Ks, 13 walks and 45 hits allowed in 39.2 innings (only one hit batter and no home runs allowed) … named to the 2014 Big 12 All-Freshman Team (3.34, 5–4, 39 K, 22 BB, 72 H in 72.0) … product of Lake Travis High School and Austin Wings summer team that won two national championships … father Alex Castano was a linebacker with the Rice football team. 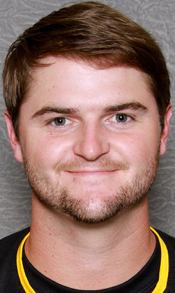 Winthrop … LHP … So. 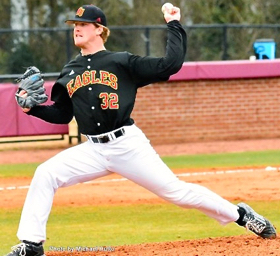 Racked up 12 strikeouts while logging the longest outing (8.0 innings) of his college career, leading Eagles to 3–0 win in series finale vs. Big South Conference contender Coastal Carolina (cb360 #42) … faced only 26 batters (two over the minimum) after limiting Chants to a single hit and three walks, with one runner erased on his 1st-inning pickoff and another on a 7th-inning lineout double play …. faced the minimum 12 batters over the first four innings and did not face more than four batters in any inning … struck out eight different Coastal starters, en route to snapping CCU’s 11-game winning streak … allowed only one baserunner with no outs on the board (leadoff walk in the 7th), while two of his four baserunners came with two outs already in the books … in addition to the dozen strikeouts (two looking), his 24 outs also included five outfield flyouts, five infield popup/linedrive outs (including the DP), one groundball out and the pickoff … has fashioned a 2.00 ERA and 3–2 record in his seven 2015 starts, with nearly a 5-to-1 strikeout-to-walk ratio (47/10) and 11 more innings pitched than hits allowed (25 H in 36.0 IP, with a lowly .200 opp. batting avg.) … served mostly as a reliever as a freshman in 2014 (4.37, 1–4 in 17 GP/5 GS, with 23 K, 15 BB and 45 H in 35.0) … product of Riverhead High School. 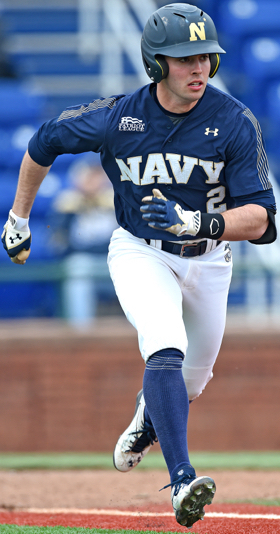 Speedy centerfielder and prototypical 2-hole hitter who played lead role in Navy’s 4-game series sweep of Patriot League favorite Bucknell: 4–2 (7 inn. ), 7–1, 2–1 (10) and 6–5 (14) … reached base nine times while totaling 11 productive plate appearances in the pair of doubleheaders, after batting 6-for-15 along with a walk, two times hit-by-pitch and four key runs scored (plus two RBI, a triple and a pair of sacrifice bunts) … in 7-inning series opener, legged out his sixth triple of the season (tied for the national lead) while batting 2-for-2 with an RBI, run scored and sacrifice bunt … capped Sat. DH by batting 2-for-4 with another run and sac. bunt … added a single in tight third game (that extended from seven to 10 innings), then played key role in 14-inning finale (four times on base while factoring into three runs, two of them in extra innings) … worked ahead of count in bottom of 11th before being hit by a pitch to bring home tying run and extend that exciting game-4 … then, in bottom of 14th, jumped on first pitch for 1-out, opposite-field single to right and ultimately scored the winning run (his gm-4 stat line included 2 runs and 2 HBP) … ended series on 10-game hitting streak while having reached base in 16 straight games (on-base in 25 of 26 games overall this season) … had been sidelined for three previous games, including midweek 2–0 loss vs. UMBC … ranks second on 2015 team with .346 batting avg. (24 RBI, 22 runs, .435 on-base pct.) … named second team All-Patriot League as a sophomore in 2014 (hit .359 with .431 on-base, 39 runs scored, 6 triples and 26 stolen bases; reached base in final 24 games) … batted .273 as a freshman in 2013 (24 R, 19 RBI, 8 SB) … helped The Lovett School win 2009 Georgia state championship, also lettering in football as a running back and corner back. 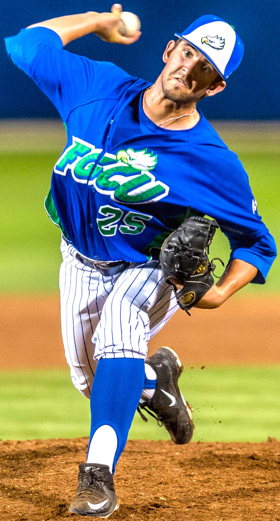 Florida Gulf Coast … RHP … Jr. 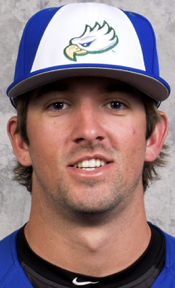 Junior college transfer who broke onto the scene in a big way during 8–1 midweek win at Miami (cb360 #12), going the distance while facing only 32 batters (five over the minimum; 4 hits, 1 walk) … his first start on the Division I level included five strikeouts, 13 outfield flyouts, six groundball outs and three infield popups/foulouts (118 total pitches) … his lone run allowed came in the 3rd inning, with only two other Miami runners reaching second base (both via stolen bases; neither advanced to third) … struck out all three batters in the opening inning and retired the first seven batters he faced, later adding three straight 1–2–3 innings in the 6th through 8th … his impressive first half of the 2015 season includes a 2.10 ERA, 3–0 record and nearly a 6-to-1 strikeout-to-walk ratio (23/4), while allowing only 16 hits (no home runs) in 25.2 innings (.172 opp. batting avg.) 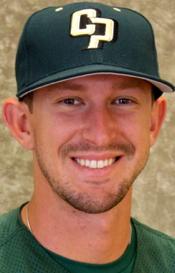 … named the Golden Valley Conference Pitcher of the Year while starring for Feather River Junior College (in Quincy, Calif.). Long Beach State … RHP … 5th-Yr.-Sr.
Fifth-year pitcher/converted closer who registered his fourth double-digit strikeout game of the season en route to the top outing of his career, matching strong complete game from UCSB’s Dillon Tate with the first solo shutout of his own career: a two-hitter that opened series at UC Santa Barbara (cb360 #15) with 2–0 win for the Dirtbags … retired first 10 batters he faced, against UCSB offense that sported a .307 team batting average and was fresh off an 18–4 rout of LMU … faced only 30 batters (three over the minimum; one reached via error), with no walks or hit batters … kept nearly every ball in the infield, with a career-best 13 strikeouts, plus 10 groundball outs, a lineout to short, one runner caught stealing and only two outfield flyouts … UCSB’s only runner who ventured past first base came in the 6th, after an E5 (throwing) and hit-by-pitch (no Gauchos reached third base) … UCSB’s only hits were Luke Swenson’s 1-out single down the leftfield line in the 4th, and pinch-hitter Billy Fredrick’s 2-out single up the middle in the 8th … posted strikeouts in all nine innings and K’d eight different UCSB batters … countered equally strong complete game from Tate (2 unearned runs, 3 H, 1 BB, 10 Ks) … has racked up an eye-popping 12-to-1 strikeout-to-walk ratio this season (61/5), plus a 2.58 ERA, 4–1 record and 35 hits allowed in 45.1 innings (.209 opp. batting avg.) 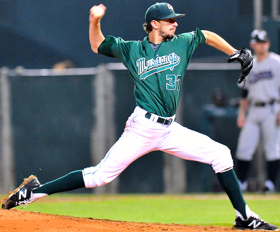 … led 2014 staff with six saves in 23 relief appearances (4.10, 2–1, 24 Ks, 6 BB) … utilized redshirt season in 2013, after earning second team All-Big West honors in 2012 (10 saves in 29 GP, 1.88, 39 Ks, 10 BB) … filled multiple bullpen roles as a freshman in 2011 (3.99, 4–2, 47.1 IP) … product of San Clemente High School. 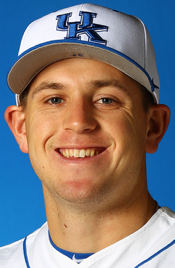 Kentucky … RHP … Sr. 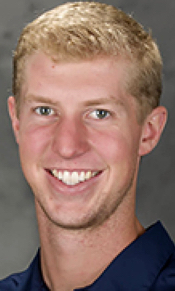 Veteran reliever who closed three wins during historic week – including pair of victories at LSU (cb360 #1), as Wildcats registered huge road series win … faced only 19 batters (three over the minimum) in 5.1 total innings during the week, with three strikeouts, two walks and only one hit allowed … in the opener at LSU, after Kentucky had taken a 5–3 lead in the top of the 12th, the Tigers had two runners in scoring position thanks to a pair of errors … took the mound to save the day (literally) in that game–1, allowing a sacrifice fly and then also retiring the next two batters for the thrilling 5–4 win … two days later, in the series finale, entered in the 8th with the ‘Cats clinging to an 8–7 lead and he ultimately picked up the win with 3.2 strong innings in that 11-inning, 12–10 victory (H, 2 BB, 3 Ks) … LSU’s tying run came on a sacrifice fly from dangerous All-American Alex Bregman (Jack stranded the other inherited runner in the 8th) … also closed out midweek 9–4 win over Morehead State, retiring both batters he faced … has totaled four saves and a 3.27 ERA so far in 2015 (8 Ks, 3 BB, 8 H in 11.0 IP) … compiled a 1.16 ERA in 38.2 innings as a junior in 2014 (4 saves, 4–1, 26 GP, 31 Ks, 8 BB, 28 H) … played in 2013 at Glendale Community College and in 2012 at Jacksonville University (9 GP/2 GS, 10.2 IP. 5 Ks) … product of Loyola High School … father Ian Jack was a member of the varsity tennis team at UC Santa Barbara … cousin Damon Lembi was a member of Arizona State’s 1994 College World Series team. Transfer addition who has settled into the pivotal No. 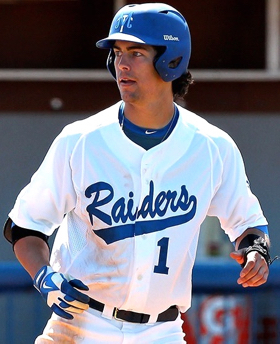 3 spot in the batting order while emerging as MTSU’s top hitter – most recently batting at nearly a .500 clip (10-for-21) during five-game week that included key sweep of Old Dominion (cb360 #47), which had taken 2-of-3 from Rice the previous week … hit safely in all five games while compiling a 1.284 OPS (.522 on-base plus .762 slugging) that included a home run, triple and double, two walks, a pair of stolen bases, four runs scored and three RBI … opened the week with a solo home run (plus a single) in high-scoring game vs. cb360 #3 Vanderbilt (a 12–7 Vandy win) … added two more hits, plus an RBI, as team’s lone bright spot in 8–1 loss vs. Lipscomb … stroked go-ahead triple in series-opening, 7–2 win vs. ODU (also had a walk and run scored) … followed with big game–2 vs. the Monarchs, batting 3-for-4 and scoring twice (2B, SB) in that 8–2 win … closed series with two more hits, plus a key 9th-inning walk as part of rally for two runs and 5–4 win that moved the CUSA-leading Blue Raiders to 8–1 in conference play … in addition to team-best .384 batting avg., has 15 RBI, pair of home runs and CUSA-best 15 stolen bases (in 16 attempts) … junior college transfer from Columbia (Tenn.) State and product of Riverdale High School … step-brother Ryan Stephens (’14) is a former MTSU centerfielder … grandfather Ron Jebavy pitched at Notre Dame while his uncle Ron Jebavy was a member of the James Madison football team. 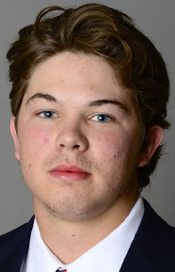 Nebraska … LHP … Sr.
Fronted 19-strikeout game from Nebraska pitching staff during rare 0–0 extra-inning thriller, with Huskers scoring in bottom of 15th for 1–0 win over Texas (cb360 #13) – en route to eventual series sweep … logged 8.0 strong innings while combining with relievers Jake Hohensee, Colton Howell and Jeff Chesnut in staff’s marathon 4-hit, 3-walk shutout … allowed three early hits but did not walk a batter and struck out nine (matching his career-best), ultimately facing only 27 batters (three over the 8-inning minimum) … part of Huskers staff that allowed only seven total baserunners, with just two reaching scoring position … retired the final 13 batters he faced … located 73 of his 102 pitches for strikes … his 24 outs included the nine Ks, plus eight groundball outs, an infield foulout and lineout, and five outfield flyouts … his stellar 2015 season had produced a 1.33 ERA and 4–0 record in seven starts, plus 33 Ks and only 9 walks in 47.1 innings (37 H, no HRs; .211 opp. batting avg.) 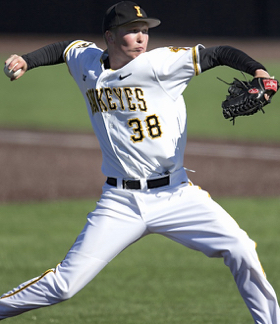 … started 12 games in 2014 (4.55 ERA, 5–2) while earning spot on Big Ten All-Tournament Team for second straight season … missed first 33 games of 2013 season due to shoulder soreness (1.81, 5–0 in 8 GS) … earned 2012 Freshman All-America and third team All-Big Ten honors (2.63, 5–1 in 15 GP, 51.1 IP) … in-state product from Creighton Prep. Southern Miss. … RHP … 5th-Yr. Sr.
Extended his impressive final season in college baseball with 11 shutout innings during pair of starts versus teams in the CB360 Top-50 (#39 Mississippi State and #26 Rice), scattering seven hits with only one walk plus a hit batter while striking out five over the two games … made pitch-count midweek start vs. Mississippi State, facing only 12 batters (one over the minimum) in 3.2 innings (2 H, BB, 2 Ks) as part of 3–0 shutout victory … returned to the mound in Sunday series finale vs. Rice and picked up the win in that 5–1 game, after 7.1 shutout innings (5 H, HB, 3 Ks) … faced the minimum 12 batters over the first four innings vs. the Owls … has yet to lose in seven 2015 starts (5–0), thanks to a lowly 0.77 ERA plus 31 Ks and only 11 walks in 45.1 innings (30 H, no HRs; .189 opp. batting avg.) 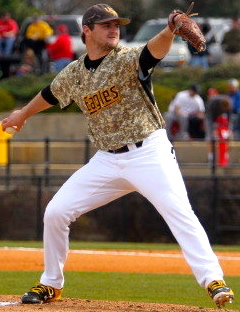 … made 13 relief appearances in 2014 (6.97, 1–0, 10.1 IP), after logging only 6.1 innings in seven 2013 relief stints … utilized a redshirt season in 2011 before filling mid-relief role in 2012 (5.11, 2–1, 17 GP, 37 IP, 23 Ks) … local product from Oak Grove High School, where he also was the starting quarterback. 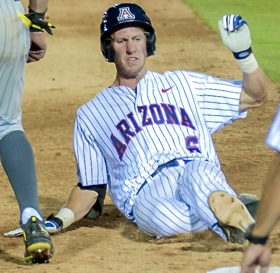 Unique commodity as a lefthanded-hitting catcher in the 3-hole, coming off solid all-around series while leading Wildcats to series sweep of visiting Oregon (cb360 #23): 7-2, 9-5 and 13-4 … reached base seven times in the series (5-for-12, with a pair of walks) while delivering an extra-base hit in each game and handling a ‘Cats pitching staff that posted three big wins … tripled and scored in series opener vs. the Ducks, then reached base three times and factored into three runs during game–2 (2-for-4, BB, 2 RBI, R, 2B) … closed series with that same stat line, as Arizona completed the sweep … now batting .324 for the season (27 RBI, 3 HR) … fourth-year starter who hit .285 as a sophomore in 2013 (37 RBI, 34 BB) … collected 2012 Freshman All-America honors (.301, 38 RBI; caught 96% of team’s innings) while helping Arizona win the NCAA title … named to the 2012 College World Series All-Tournament Team, after batting 7-for-17 in Omaha … selected by the Philadelphia Phillies in the 21st round of the 2011 MLB Draft … southern California product, from San Marcos High School … his four older siblings are quadruplets (three brothers and a sister) … father Mitch Moore played minor league baseball in the Angels organization … brother Keric Moore was a varsity foil fencer at UC San Diego. 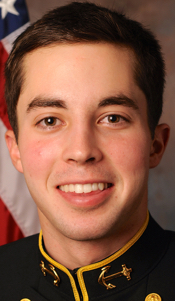 Michigan … RHP … Fr. Promising rookie addition who delivered in big-game setting with 7.1 shutout innings, as Wolverines won 10–1 to split doubleheader vs. visiting Maryland (cb360 #19) – en route to eventually wining the series … limited the Big Ten’s top offense to five hits and one walk, while striking out six … kept the bulk of his outs (16 of 22) in the infield, with the six Ks along with nine grounballs outs (four back to the mound, plus a timely double-play ball) and a popup to the shortstop … opened the game with a 1–2-3 inning and did not allow any runners past second base … has compiled a 2.92 ERA while going 2–2 in seven starts so far in 2015, with 32 Ks, 18 walks and 34 hits (no HR; .223 opp. batting avg.) 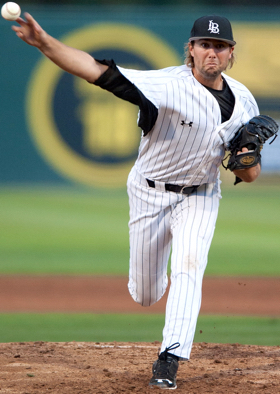 in 40.0 innings … product of South Elgin High School. 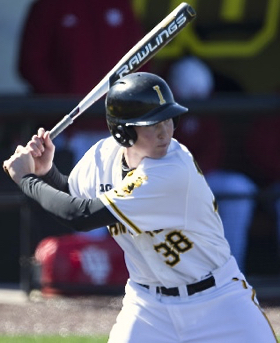 … hit 6-for-17 during four-game week, with three RBI and a pair of runs scored … tripled in midweek 5–2 loss vs. Bradley … drew a walk in gm–2 vs. the Hoosiers, then enjoyed big offensive game in the 10–6 series finale – batting 4-for-5 with two RBI and a pair of runs scored … the weekend produced Iowa’s first sweep of a top-25 opponent since 1990 … has compiled a 2.39 ERA and 3–2 record in his seven 2015 starts (35 Ks, 11 BB, 37 H in 37.2 IP) … ranks second on 2015 team with .329 season batting avg. 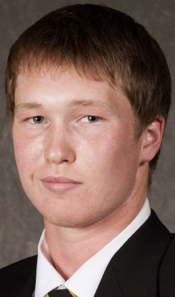 (12 RBI) … as a sophomore in 2014, made 37 starts at first base (.331, 28 RBI, 2 HR) and 14 on the mound (4.96, 5–1, 45 Ks, 33 BB, 76 IP) … started his college career in 2013 at Iowa Central Community College … local product who starred in baseball, football (wide receiver) and basketball at Dallas Center Grimes High School … father Byron Peyton played professional baseball in the Cincinnati Reds organization … both of his parents played college sports at Buena Vista University, in Storm Lake, Iowa (father: baseball and basketball; mother Jana: tennis). Turned in a season-long eight strong innings in game–2 at Mississippi State (cb360 #39), leading the way in 4–0 series clincher – as Auburn posted consecutive road shutouts vs. an SEC opponent for the first time since 1967 (first vs. SEC opponent, regardless of site, since ’88 and program’s first back-to-back shutouts vs. any opponents since 2001) … also launched early solo home run in series finale, a 3–1 win for the host Bulldogs … limited ‘Dogs to four hits, plus one walk and a hit batter, while striking out five in his eight shutout innings … his 24 outs in the 121-pitch outing included the five Ks, six groundball outs, three infield popups and nine outfield flyoutts (plus a runner gunned down at the plate) … served as DH in series finale, batting out of the 8-hole, and pulled 1–1 pitch over leftfield fence to forge 1–1 game in the 3rd … has gone 5–2 with a 3.38 ERA in his seven 2015 starts, while compiling a 4.3 strikeout-to-walk ratio (43 Ks/10 BB in 45.1 IP; 43 H, .251 opp. batting avg.) 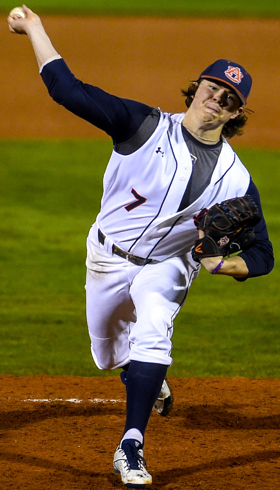 … posted a Freshman All-America season in 2014 (2.01, 5–3, 14 GP/12 GS, 73 Ks in 89.2 IP, .192 opp. avg.) … three-year prep All-American and two-time Gatorade Alabama State Player of the Year, while starring for Cullman High School … won gold medals with Team USA youth national teams on the 16U and 18U levels … projected to be a top-20 overall prospect for the 2016 MLB Draft (per Perfect Game). 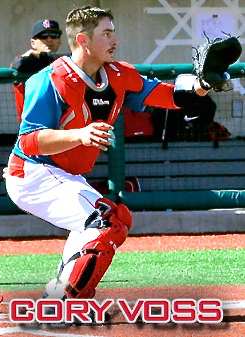 Recorded multiple hits in all four games during the week, while batting at a .562 clip (9-for-16) with extra-base hits in all four games, plus a pair of walks, four runs scored and an RBI – as the NCAA Tournament hopeful Lobos snapped a six-game losing streak with 7–6 win at Texas Tech (cb360 #27) before winning key Mountain West series vs. Fresno State (1–8, 5–1, 6–5) … hit 2-for-5 with a run scored in the midweek road win over the Red Raiders, with his double sparking UNM’s four-run top of the 2nd … led the way in series opener vs. Fresno, batting 3-for-5 (with a double), scoring twice and adding an RBI … the next day, went 2-for-4 and doubled for third straight game, as one of few bright spots in game-2 loss … played lead role in series-clinching win, reaching on all four of his plate appearances (2-for-2, 2 BB) while scoring once and legging out an RBI triple (his MWC-leading fifth triple of the season) … ranks second on team with .361 season batting avg. (15 RBI, 2 HR) … product of Pueblo South High School … drafted in 2014 by his home-state team, the Colorado Rockies (34th round).